2 yr. owned used Nissan Sentra 2005, bought used. 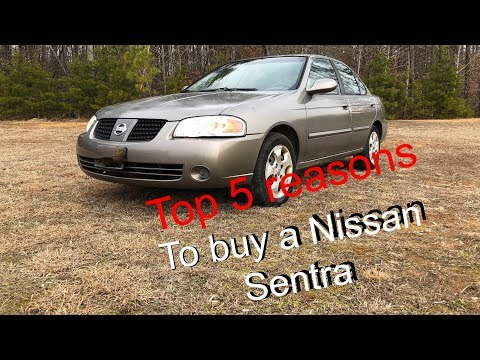 The car that I drive, a Nissan Sentra 2005 is definitely an older model vehicle. I bought it used and have had it 2 years and so far the only thing I have had to replace on it is windshield wiper blades and 4 new tires. It runs pretty good and the only drawback is in my opinion is that the radio knobs and heater and air conditioner settings seem to be cheap because they break off easily. I live in west Virginia where they do the state inspection and mine is coming up and the vehicle does have some rust on it so I do not believe it will pass and I am not going to do any body work to fix it so I will be looking for a new vehicle. But as far as the car goes I really didn't have much trouble with it and was pretty satisfied with it. It got pretty good gas mileage for as old as it was. The CD player did not work but the stereo wasn't bad with decent speakers. How to care for it. What are the best oils needed for your type of model. I like that it hold gas well. However, the Service Engine Soon light always comes on. My Transmission is often messing up and the brakes are bad. The money I'll be spending to take care of it all should be going towards a new car. Oh, and my mechanic just recently died a few months ago. He's been taking care of my car since 2011 (the year I got it). So now I have to spend more for maintenance. I would purchase another Nissan Sentra. Slow to defrost windows. Adequate pick up. Very reliable. Starts readily every time driven. Perfect amount of room in front seats. Legs cramped in back seat. Nice radio and CD player. Nice shiny metal flake paint job which has never faded. Rear bumper does not handle minor, low impact collisions. Original price quite reasonable. No mechanical issues. Just requires routine maintenance. DEALERS WILL CHECK THE VAPOR HOSE CONNECTIONS IN THE FUEL TANK TO DETERMINE IF A POOR SEAL EXISTS. IF A POOR SEAL IS IDENTIFIED, A NEW FUEL TANK WILL BE INSTALLED. THE RECALL IS EXPECTED TO BEGIN ON AUGUST 15, 2005. OWNERS SHOULD CONTACT NISSAN AT 1-800-647-7261.